Proper mowing is one of the most important practices in keeping your lawn healthy and we, at All American Landscaping, take pride in just that. Grasses are like most plants — if you clip off the growing points (for grass, it’s in the crown, where the new leaves develop), the plants branch out and become denser, which in this case, turns thousands of individual grass plants into a tightly woven turf or a lawn. If you didn’t mow at all, your yard would look more like a prairie than a lawn. But the mere act of mowing isn’t what makes a lawn look good. Mowing height and mowing frequency determine how healthy and attractive your lawn looks. After all, cutting a lawn is stressful for the grass. The leaves make the food for the roots — and how would you like it if someone kept cutting off your food? Height does count! Most grasses have a range of recommended mowing heights. Stay at the upper end of that range when the lawn is under stressful conditions, such as hot weather or drought, or if you have a shady lawn. In cooler weather, you can cut the grass a little lower. Most lawns should be cut between 3”4”. Follow the one-third rule. For a thriving lawn, never cut away more than one-third of the grass blade in any one mowing. If the grass “gets ahead of you” because of wet weather or your busy schedule, move up the cutting height of your mower to the highest possible setting and mow. If clippings are too long and heavy, even at that cutting height, catch them with the bagging unit or clean up after mowing with a leaf rake. 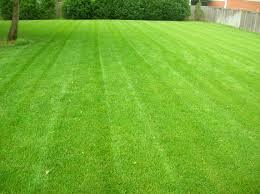 Then move the cutting height back to your normal range and cut the lawn again a few days after that first mowing. Edging and trimming are the finishing touches of mowing, kind of like getting a shave after you’ve had a haircut. Edging and trimming are pretty close to being the same thing. Some tools are called edgers because they’re designed to trim the lawn along a hard surface like a driveway or sidewalk. Edgers cut a nice clean edge, but leave some dirt and grass debris that you need to clean up. On the other hand, you can use trimmers anywhere — along a hard surface, in tight spaces, next to planting beds, and so on. Trimmers also leave some clippings on paths and driveways that you need to sweep up. We use both pieces of equipment at All American Landscaping. Lastly, grass clippings are valuable organic matter, chock-full of nitrogen and other nutrients. As long as you mow often enough to remove no more than one third of the grass blade, the easiest thing to do is just to leave clippings on the lawn. The pieces break down quickly and reduce the amount of fertilizer you have to use by as much as 25 percent. And research has proven that the clippings don’t cause thatch to build up. Lawn aeration & dethatching are secret weapons in making your lawn healthy. Over time, lawns accumulate thatch. Thatch is a layer of slowly decomposing grass, dead roots, and other yard debris that’s picked up by the mower and tossed back onto the grass. The accumulation of thatch over time prevents water and other nutrients from getting through to the roots of your lawn. Accumulation of thatch, like the compacted soil, also gives insects a great place to hide. You can tell how much thatch has built up by using an aeration device to remove three plugs of soil. The top layer of the plug that looks kind of like peat is your thatch. If it measures more than one-half inch, it is time to dethatch. It’s best to dethatch your lawn just before it begins growing the most vigorous for the season.